A senior care nurse takes on a special responsibility as a caregiver to an older person. Several important factors will help you determine if a nurse will be a good match for you or your loved one. Some of the qualities that you should look for include level of training, knowledge, and experience in dealing with the elderly. The safety of the senior is the main priority. A senior care nurse must be able to safely perform all of the special needs of their patient. When selecting a senior care nurse, you will want to make sure that they have the experience to handle your special health needs. For instance, if you are in a wheelchair or have mobility issues, your nurse should be able to safely transfer you in and out of bed. If you need assistance dressing and bathing, these tasks require a trained nurse caregiver. The same holds true in the event of a patient suffering from cardiac or lung issues. The senior care nurse must be capable of identifying an emergency, and knowing what to do in the event of a health-related emergency. This holds true whether the nurse works in a facility or in the patient’s home. Nurses see patients in a variety of settings, from the office to home. There are times after a hospital stay that a senior patient requires home nursing care. You’ll want to be sure that your nurse is familiar with your medications. It’s important that the senior care nurse pays close attention to detail to medication dosages and the scheduled times to administer each. If a senior patient needs assistance with cooking or eating, a senior care nurse should be able to prepare healthful meals and monitor food intake restrictions. For example, a patient may be on a low sodium diet or may need to avoid certain foods in order to prevent drug interactions. You will also want to look for a nurse who will keep the patient’s space clean and tidy at all times. 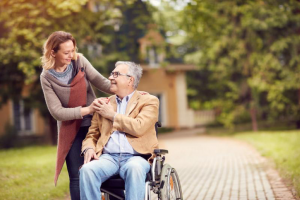 Once you are sure that a senior care nurse has the experience and skills that you need, the other important factors involve his or her personality traits. Your nurse should be patient and compassionate. A bit of kindness goes a long way, especially if the patient is sick or ailing. The successful senior care nurse needs to be a pleasant companion as well as an efficient healthcare provider. Hiring a healthcare provider for you or your loved one can be a difficult challenge. That’s why we are here. We specialize in homecare and we want to help you get the best care possible.